Tom Wolf is now the 47th governor of Pennsylvania. HARRISBURG, Pa. (WPVI) -- Democrat Tom Wolf took office Tuesday as Pennsylvania's 47th chief executive, portraying himself as a political outsider and appealing for bipartisanship in a divided state government plagued by budget deficits and partisan stalemate. "I am an unconventional leader," the former businessman said in an inaugural ceremony outside the Capitol that attracted more than 2,000 people. "I may be the first governor of Pennsylvania who ever operated a forklift, ever managed a hardware store. I volunteered for the Peace Corps. I ran a business." Wolf outlined his goals in positive, general terms - creating good-paying jobs, equalizing educational opportunity in public schools and providing "a government that works." He did not mention a projected $2 billion-plus revenue gap for the fiscal year that starts July 1 or his proposals that include levying a new tax on the natural gas industry, overhauling the state income tax and increasing public school funding. Read the text of Tom Wolf's inaugural address after he was sworn in as the 47th governor of Pennsylvania and watch the video. Wolf, who ran his family's building-products distribution company for nearly three decades, defeated Republican Gov. Tom Corbett after plowing $10 million of his own money into a highly effective TV ad campaign for his first campaign. He was the only Democrat nationally to unseat a sitting Republican governor in the Nov. 4 election and is scheduled to present his budget proposals in an address March 3 to the Legislature. Gas drilling protesters shouted, "Ban fracking now!" while Wolf was taking his oath and during his speech. At least two of the 50 demonstrators were removed from the stands. The new governor said he understands the indifference and cynicism of many Pennsylvanians, noting that fewer than half the state's registered voters turned out for the election. "Our experience has made us cynical, but we cannot allow that cynicism to deflate our democratic spirit or destroy our capacity for effective self-governance," he said. 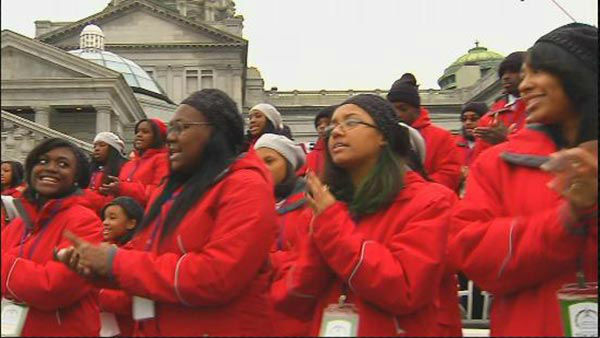 Wolf, 65, was introduced at the ceremony by former Democratic Gov. Ed Rendell. Other ex-governors in attendance were Corbett, Tom Ridge and Mark Schweiker, all Republicans. 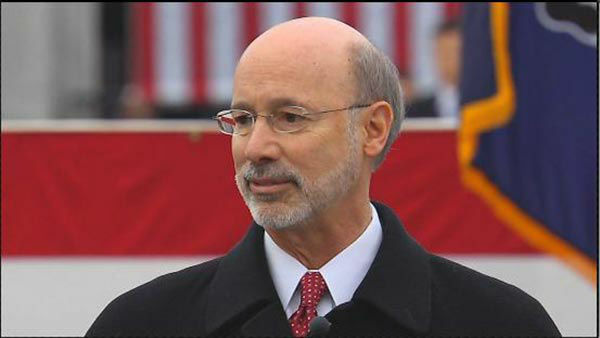 Democrat Tom Wolf has been sworn in as the 47th governor of Pennsylvania. Wolf's running mate, Mike Stack, who represented a Philadelphia district in the state Senate for 14 years, was sworn in before Wolf. Stack took his oath from his mother, retired Philadelphia municipal judge Felice Stack. Stack is relinquishing his seat in the Senate, but the duties of his new office include serving as the chamber's presiding officer. On his first day in office, Wolf planned to fulfill his promise to sign executive orders barring all executive-branch employees from accepting gifts and prohibiting no-bid contracts with private law firms. Post-inaugural events include an art show at the Pennsylvania State Museum and will culminate Tuesday night in a $100-a-ticket bash at the Hershey Lodge that will feature live musical performances and an array of food and drinks from across the state.